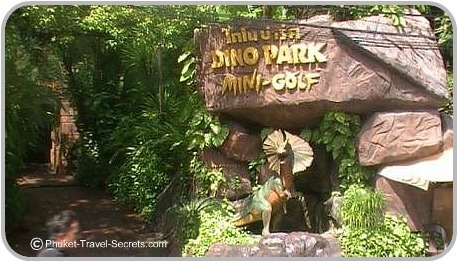 Dino Park mini golf course provides lots of fun for the whole family. This mini golf course is located on the hill between Karon and Kata beaches, directly next door to the Marina Phuket Resort. This is possibly one of the best activities for kids of any age and adults will enjoy it as well. Not only will the kids enjoy the golf, they will also enjoy a variety of roaring prehistoric dinosaur replicas like T Rex, Stegosaurus, Pterodactyl and Brontosaurus . 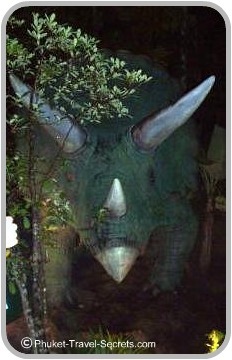 Each of the 18 holes throughout the mini golf course are decorated in a unique prehistoric theme. This is so much more than just a mini golf course. Inside the park you will find caves, waterfalls, streams and an erupting volcano to name a few. If mini golf is not for you, you are welcome to walk around and take photos. However, you will still have to pay an admission fee which is half of what you would pay if you were to play. Not only is there a putt putt golf course at the park there is also a street bar which is made from concrete rocks. There is also an open air restaurant that serves a great Dino Burger and a range of western food and Thai meals at reasonable prices. Kids prices depend on how tall your kids are, not by age so if your kids are tall for their age they will have to pay adult fares. 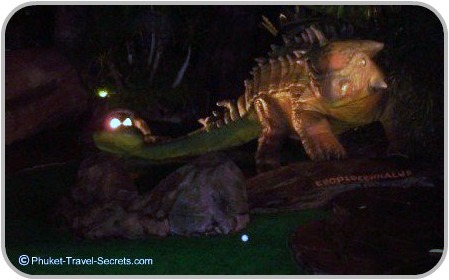 We can thoroughly recommend a visit to play a round of mini golf with a difference followed by a Dino Burger. 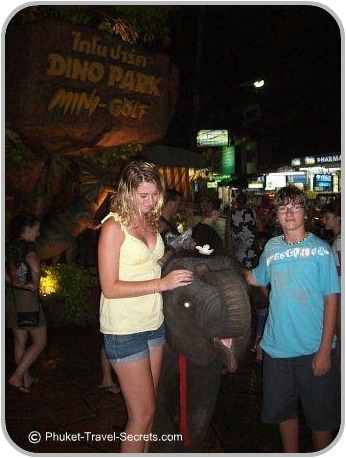 Most evenings you will be able to see a baby elephant just outside the entrance to Dino Park, if you like you can pay 20 baht to feed the elephant. Apart from trying to beat the heat the lighting at night is incredible (sorry our photos do it no justice). The park is open daily from 10.00am to midnight. For more information, have a look at their Website. 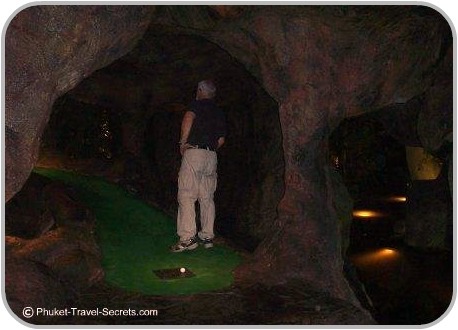 If your staying on the northern part of the island and want to play mini golf but don't want to make the trip down south there is also Phuket Adventure Mini Golf at Bangtao Beach.